Cut the pork into bite sized pieces and clean thoroughly. Marinate pork in 2 tsp vinegar, 2 tsp soy sauce, 1 tsp turmeric, 1 tsp pepper and salt for 30 minutes. Pressure cook the marinated pork along with water. Add enough water so as to cover the pork. Pressure cook it for 2-3 whistles or till the pork is cooked. Heat oil in a pan. Add onions and saute till translucent. Add green chillies, ginger and garlic paste and fry for a minute. Add curry leaves and cilantro and stir fry till the onions begin to brown. Next, add 2 tbsp coriander powder, 1 tbsp red chilly powder, 1 tbsp ground garam masala powder, 1 tsp pepper and fry for a minute. Add tomatoes along with salt and stir fry till the oil separates from the gravy. 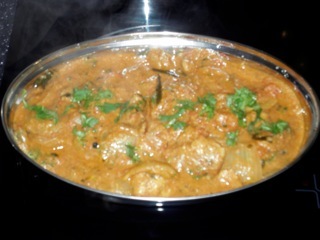 Now add the cooked pork along with the remaining water from the cooker and mix well till it is coated with the gravy. Cover and cook on medium flame for 15 mintues, stirring occassionally.